On days off school my mom would take us to this awesome dinner for breakfast. It was my favorite. A bunch of old grumpy guys, metal stools and a real counter like in the moves. We were allowed to order ANYTHING we wanted and I always ordered the corned beef hash. I’ve never been a sweet breakfast girl. I’ll take savory, flavorful, fill you up hash over sugar drenched waffles any day. On one trip to the dinner the hash was a little different. The waitress mentioned that they had started making their own recipe instead of the can. All this time I thought my “dream breakfast” was some fancy kitchen concoction. But it ended up being even better in a way since now I was able to buy the one I loved and have it whenever I wanted. I kid you not, to this day you will always find a can of HORMEL® MARY KITCHEN® Corned Beef Hash in my cupboard. Told you love affair! 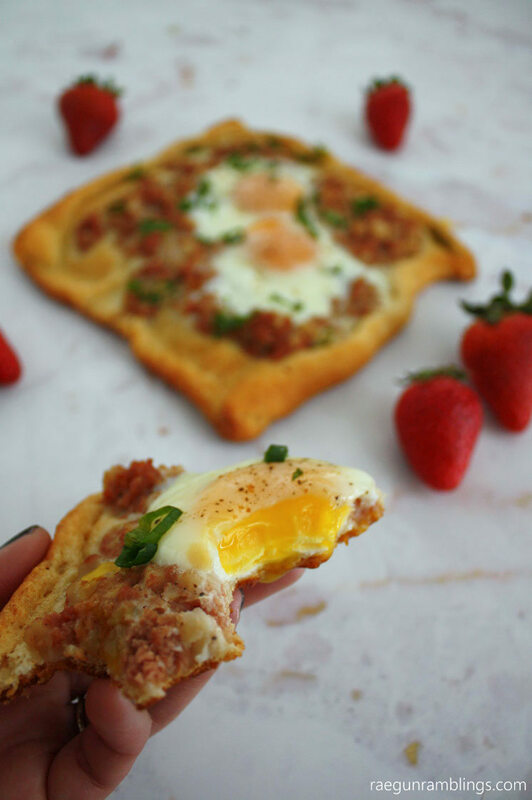 My favorite way to eat it is cooked on a griddle with a couple of fried eggs so the yolks are all nice and runny in the corned beef but I thought I’d fancy things up a bit today with a super easy entertaining friendly Corned Beef Hash and Eggs Breakfast Squares recipe. These have all the same flavor but bump it up a bit in presentation. Unroll the dough and separate into two squares. Roll up the edges of each square. 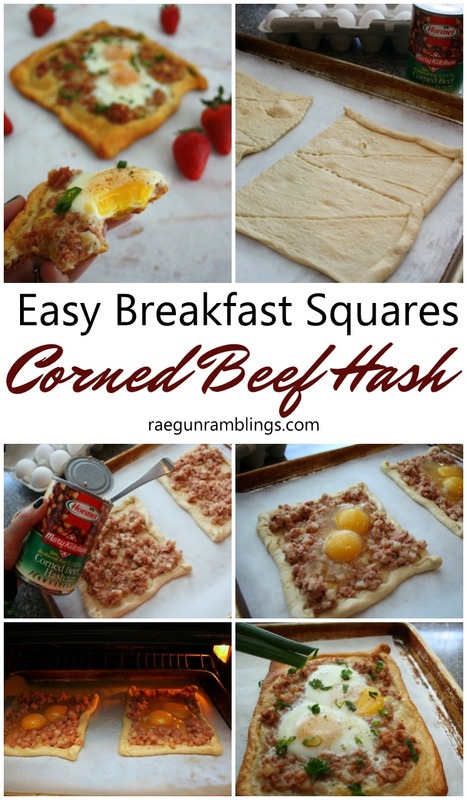 Scoop about 1/4 of the can of HORMEL® MARY KITCHEN® Hash onto each square. 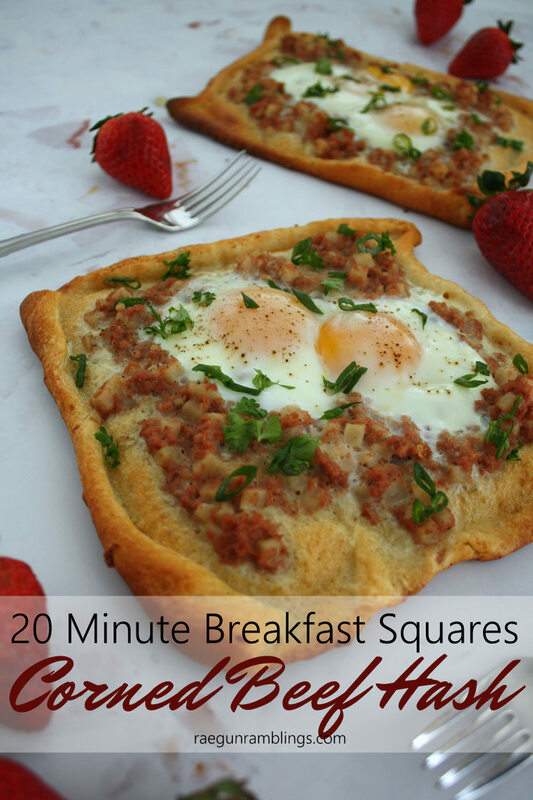 Top each square with 2 eggs and sprinkle with salt and pepper. Bake at 400F for 12-15 minutes until the dough is browned and eggs are cooked to your liking. Note that the eggs might still look very wet but will be cooked just pull them out and touch them the first time you make it. Also they may keep cooking a bit while they sit on the pan. These pictured were cooked for 17 minutes and I wish I had taken them out a bit sooner since the whites and yolks were totally set. Still delicious but I you should just know the eggs will seem really wiggly due to the baked nature but they will be cooked. Sprinkle with green onions and parsley if desired. These can be served fresh and hot or room temp. This makes 4 hearty servings. You could even split them up to get 8 smaller servings for a lighter breakfast or if you are serving it with other items. A fun way to do that would be just to make one long sheet and cut them after they are baked or just make smaller rectangles! Just in case you are a HORMEL® MARY KITCHEN® Corned Beef Hash newbie *gasp* it’s very small soft corned beef and potatoes. It truly is one of my favorite foods you can ask my family. 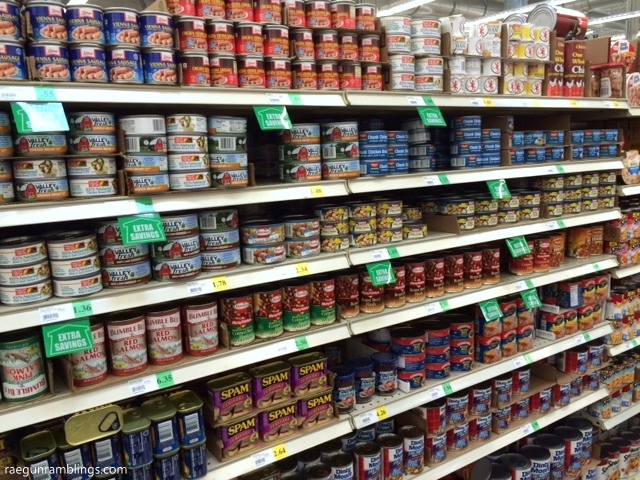 I got mine at Winco Foods but really you can get it at pretty much any grocery store by the tuna fish and other canned meats. And right now through 3/17/2016 you can use this coupon to SAVE $1.00 on the purchase of any two (2) HORMEL® MARY KITCHEN® Hash products. 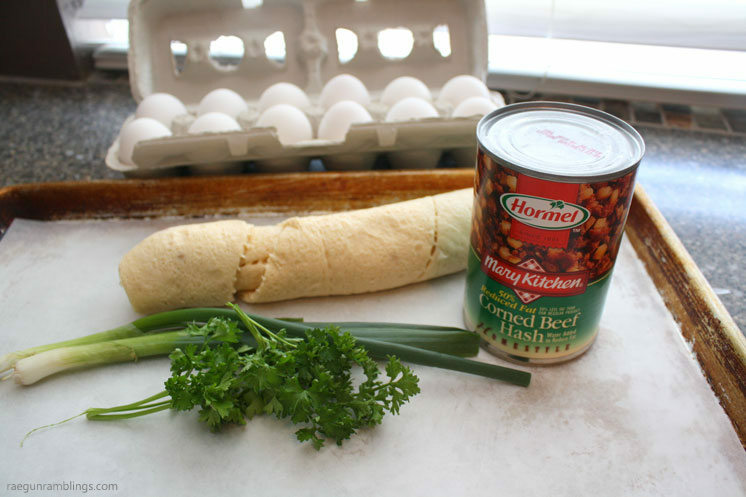 Do you have a fun food memory like my corned beef hash story? I’d love to hear about it in the comments! My youngest, now 24, has had a love affair with Mary Kitchen corned beef hash since he was a toddler. We have an original can of it before it was bought by Hormel. It sits in the pantry with a note that says ” do not eat” display only! I sent this post to him. Oh, dear Lord this looks delicious. No one understands my relationship with corned beef hash. what is the nutritional content of this breakfast. It sounds yummy. I’m not sure but you could plug all the ingredients into My Fitness Pal and it would calculate it for you! I love corned beef hash but have never tried this brand – it’s going on my grocery list. My mom used to make corned beef hash from the leftovers of her New England boiled dinner ( corned beef, potatoes, carrots, turnips, onion, rutabaga – hate turnips and rutabaga – as a little girl I couldn’t tell the difference in appearance between the potato and the turnip, but when I put it in my mouth – YUCK). I have fixed eggs with the hash before and liked it – so I’m going to try it again. 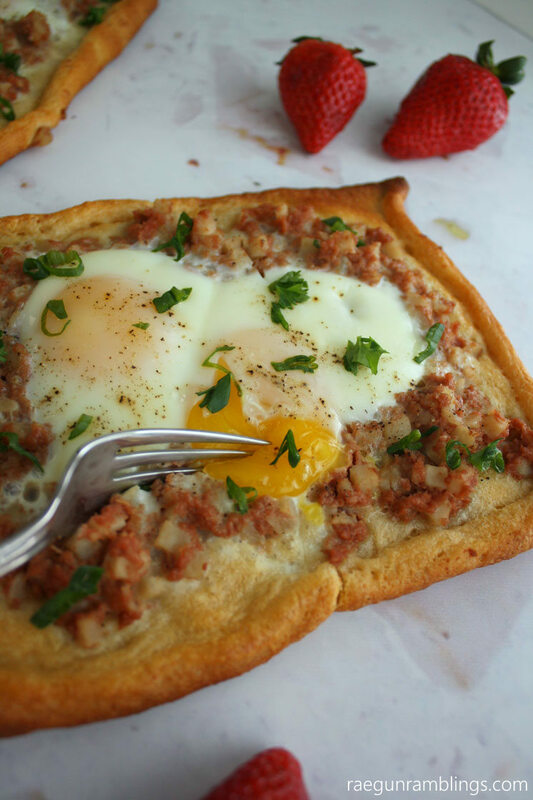 The recipe sounds good but I can’t eat gluten/wheat, so I’ll just stick to the hash and eggs. Thanks for the reminder about hash and I’ll look for the brand to try. Just made them and they are marvelous! Great combination.